Acupuncture (including Cosmetic and Infertility Acupuncture: high success with fertility) and Cupping, Diversified Technique, Kinesio-Taping, Flexion / Traction, Physiotherapy Modalities, X-ray, Additional Training: Activator, Cranial/Sacral, Atlas ("hole in one"), Upper Cervical, (ABC) Advanced Biostructural Correction and Webster Technique (especially during pregnancy). High success with fertility and pregnancy issues). Doctor of Chiropractic (Dean's List) from National University of Health Sciences and Acupuncture Doctrine (Dean's List). 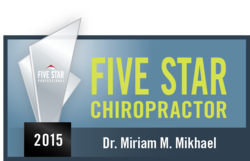 Honors/Awards: International Association of Chiropractors (International Association of HealthCare Professionals), Top Doc Worldwide leaders, Nominated Top Doc of Chicago, Plumwise recommended, Who's Who, Five Star Chiropractor in Chicago Magazine, and "Women You Should Know". High success with fertility and pregnancy issues. I have been practicing since 1997 throughout the greater Chicagoland area at a number of different locations, including: Chicago Institute of Neurosurgery and Neuroresearch (CINN), Total Athleticare inside Bally Total Fitness Center, and at the Center for Integrative Medicine (CIM) at Northwestern Memorial Hospital. Insurance plans that include chiropractic care and acupuncture will usually cover acupuncture treatment provided by a chiropractor. I am a chiropractor and acupuncturist who believes that every patient has specific needs, of available treatment options, to overcome obstacles to good health. I strive to achieve optimal results through a multidisciplinary approach (including prevention) that specializes in you, the patient. In-network with BCBS PPO, Aetna PPO/HMO, Choice Care, Beech St, Guardian and all PHCS. We accept PI/ Motor Vehicle Accident Insurances. Most other insurances accepted. Insurance plans that include chiropractic care and acupuncture will usually cover acupuncture treatment provided by a chiropractor. Some student insurances accepted.